Take care of your jewellery and it will shine for years! Care for jewellery like these earrings from Gemoro. Don’t store your diamond jewellery next to other jewellery pieces as this can cause scratches. A fabric-lined jewellery case with separate compartments is Ideal. You can also individually wrap jewellery in soft tissue paper or use jewellery pouches for each piece. Regularly inspect your diamond jewellery to make sure the setting is secure. If you notice any signs of damage or loosening of the prongs, take your jewellery to your jeweller. It’s a good idea to have your diamond jewellery examined at least once a year by your jeweller. In addition to performing any necessary repair work, your jeweller can professionally clean your jewellery. Jewellery set with gems can be brought to life by careful cleaning with a soft brush and soapy water. Try not to get threaded pearl or bead jewellery wet – you could ruin it. Don’t use harmful solutions. 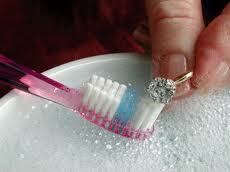 Chlorine or abrasives should never be used when cleaning diamonds, especially those set in jewellery. Regular cleaning will keep your diamond jewellery in lustrous condition and ready to sparkle.